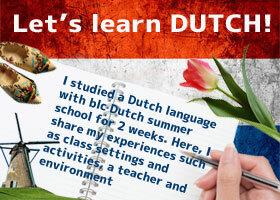 blc Dutch Summer school provides the intensive Dutch language lessons in serene accommodation. My husband and I decided to enroll this Dutch summer school. We attended 2 weeks course in Durenthe where we choose one out of two venue-options: Durenthe and Amsterdam. I studied hard?! and met friends from different countries and great teachers. It was nice learning experience and a good summer memory. Some of my friends told me that why I need to learn Dutch. My husband is not Dutch, I can live in Netherlands without speaking Dutch...it is not UN language (in my field, it is critical to learn these UN languages...I can be competitive more than people just speak English.) There is no "useless language"! My reasoning is here 1. Why I need to learn Dutch? Here, I wrote my experience with some reflections. I hope these articles encourage you to study Dutch. 1. Why I need to learn Dutch? 3. How is the Dutch Language class goes? 4. How is our teacher in the summer school? These are my view and experience...therefore, if you want to know more about the school, please visit their official website>> blc language course website, call or email? They will answer you more. How is the Dutch Language class goes?